There is A Lot of Chopping and Cutting Happening at My House Lately! Did you ever hear the saying, "You don't know what you don't have, until you DO have it!" 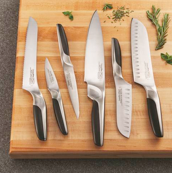 But it is so relevant for me lately because I recently became a Chicago Cutlery Mom Ambassador and, thus, I received three great knives from the Chicago Cutlery line of knives! I thought I had good knives before, but they are nothing compared to these amazing Chicago Cutlery knives! I didn't know how bad my knives were until I used these new Chicago Cutlery knives! I am so excited to use these knives and become a faster and more precise chopper, cutter, and dicer! I would not say I am by any means an expert...in fact, if I am honest, I would say I am a beginner in the knife department. 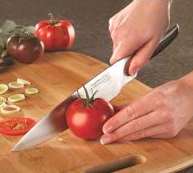 I chop up veggies frequently and occasionally some meats, but I would love to learn how to use a knife like an expert. I LOVE watching the experts on the Food Network chop and dice with their incredible speed and I would love to show off those kind of skills with my new Chicago Cutlery knives some day! Another goal I have is to be able to prepare healthy meals for my family quicker and more efficiently...especially since I never seem to have the time with two children ages 2 and under. With these Chicago Cutlery knives, I can get more done in a shorter amount of time and I won't be as frustrated while doing it! Currently, my knives can sometimes really anger me because half the time I feel like I am either sawing at the foods, trying to make the knife cut a straight line or struggling to hold it without cutting myself! Just from first glance and first hold of these knives, I know they are going to revolutionize the way I run my kitchen and prepare foods! These knives are already teaching me how to hold knives correctly because they offer an innovative grip that guides my hand for superior control and cutting and the ultra sharpness and high quality Japanese steel blades of the knives work amazingly for effortless cutting! So stay tuned for more info about these knives in the coming weeks, a video demonstration, and even a GIVEAWAY for YOU to WIN your own Chicago Cutlery Knife and revolutionize your kitchen! 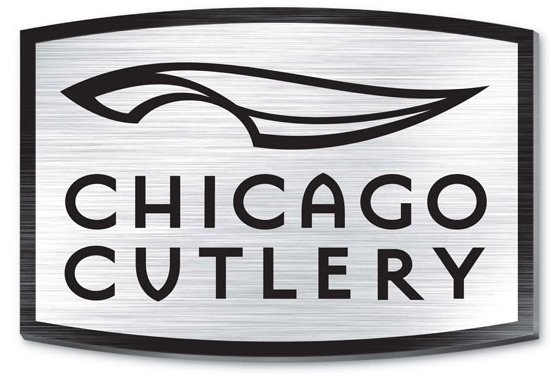 And if you want to find more info about these great Chicago Cutlery DesignPro Knives or want to know where to buy them, check them out on Amazon.com.